This vintage camper was given a facelift with some crocheted fabric strips fastened to its exterior walls. The DIY remodel gives it an extremely cozy look. This pink palace is fit for any girly girl. The pink stripes on the outside and the pink accents on the inside make it the camper of any princess' dreams. This camper exudes Southern comfort and looks like a homey cocoon with quilt squares lining the walls and ceiling. This rosy cottage brings the outdoors inside with soft floral patterns and fresh rose bouquets in the window. This vintage home-on-wheels looks cozy and inviting with warm wood walls and fluffy quilts. With all of your home essentials packed into this tiny home, you're ready for any adventure that comes your way. The "boho" bedding paired with the sleek wood walls make this camper the rustic getaway of your dreams. Miranda Lambert leads a nomadic life when she hits the road and goes on tour. So the designers from HGTV's "Junk Gypsies" fixed up this retro airstream camper for the country star. The high-style camper is perfect for "glamping". 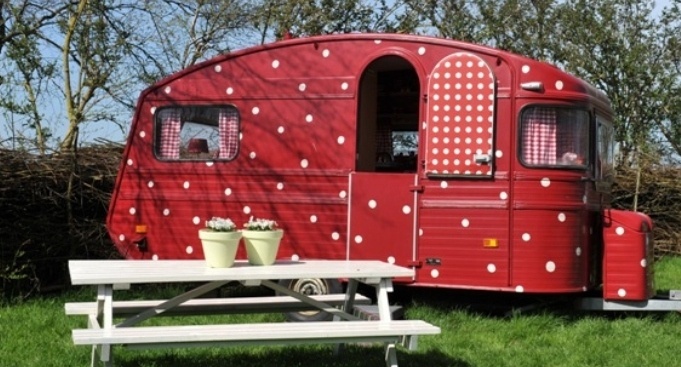 Don't let the adorableness of this polka-dotted camper fool you - This house-on-wheels is ready to do some serious adventuring. Who says campers are just for camping? This retro camper was transformed into a mobile sweet tea stand. Calling all wannabe gypsies and would-be nomads: Is the open road calling your name? If you're tired of being cooped up in your house and yearning for adventure, trade in your home for one of these vintage campers that were "upcycled" into dreamy gypsy abodes. These tiny mobile homes are sustainable, cozy, efficient and chic. And if you dream of traveling the country, they'll surely cure your wanderlust.